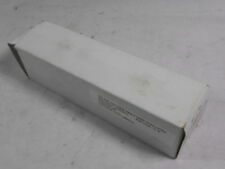 NEW, FERRAZ A070GRB25T13, 25 AMPS, SEMI CONDUCTOR FUSE, 660V AC MAX. Blow Characteristic Fast Acting. Fuse Current 500mA. 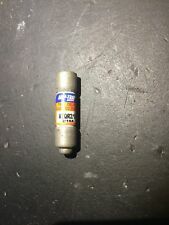 Fuse Size Imperial 13/32" x 1-1/2". During that process you will be issued with an RMA number. Ferraz Shawmut 10X38 10A 500V aM C/I H213102J FR10AM50V10I NEW! 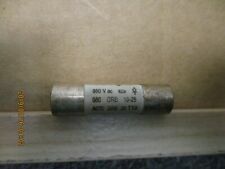 500V 10A 10x38 MM IND FUSE aM. Shawmut ATQR 4/10 is Equal to Buss FNQ R 4/10. WE HAVE THE FUSES! THE OTHERS HAVE EXCUSES……. Amp Trap 2000. New In Box. Ferraz Shaw 30A 600V High Speed Semiconduct Box With 10 Fuse A60Q30-2 NEW!!! Semiconductor Fuse. Current Limiting. BUY BOX WITH 10 FUSES! Lot of (8) NEW Ferraz Shawmut TR35R Smart Spot Tri-Onic 35-Amp Fuses. Ferraz Shawmut Book Of Electrical Information is a very nice book to include in your tool box. Book contains 150 pages of electrical information. 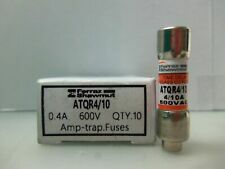 NEW, FERRAZ SHAWMUT AJT5 FUSE, 5 AMPS, 600V AC MAX, CLASS J, 6 PC'S LOT. MERSEN/FERRAZ SHAWMUT AMP-TRAP 2000, A6D200R, 200A, 600V ,NEW, FREE SHIPPING New, unused, in original manufacturers packaging. This product has never been put into service Items ship via USPS within 48 hours of payment. Items are shipped with great care to insure customer satisfaction. We have a 14 day return policy and the buyer pays the return shipping costs. Thanks for your business. See photos for more info and specs. Fuses are new. Cat# TRS200R. Manufacturer: Ferraz Shawmut. Item: Fuse. Condition: New. Catalog No: A50QS100-4. MOUNTING TYPE BLADE, BOLT-IN. A50QS MODEL. Catalog No: A50P70-4. Volts: 500. A50P MODEL. APPROVAL UL. Catalog No: A60X600-4. Volts: 600. A60X MODEL. APPROVAL UL. Fuse Holders (23). Circuit Breakers (81). High Quality Electronic Parts. Witonics® specializes in the sales of high-quality electronics components and repair kits. With over 25 years of experience in the field of electronic components, Witonics® has acquired a vast amount of knowledge on different types and functions of electronic repair kits. Shawmut OTS 3 is Equivalent to Bussmann NOS 3. New In Box. 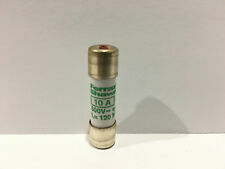 SEMICOND FUSE 250A. Catalog No: A50QS250-4. Volts: 500. UL Class CC Fuse. Highly Current Limiting for Low Peak Let Thru Current. Physical Size: 0.41" x 1 1/2". 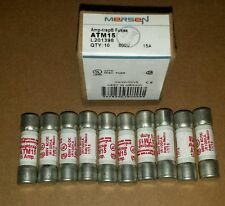 NEW, FERRAZ SHAWMUT (MERSEN) AJT25 FUSE, 25 AMPS, TIME DELAY, 600V AC MAX. Ferraz Shawmut 14X51 8A 500V 222215J with striker, BOX WITH 10 FUSES NEW!!!!!! 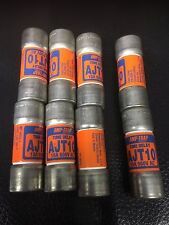 14x51 MM St FUSE aM with striker. Size 14,3x51 aM 500VAC with striker. BOX WITH 10 FUSES!! Rated current I n.
Heavy Machinery & Vehicles must be loaded solely by the Freight Forwarder. We will work with your Forwarder or Exporter to the best of our ability. 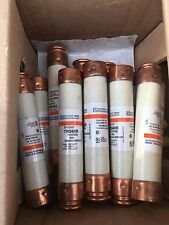 FERRAZ SHAWMUT 22X58 25A aM 690V AC D215651J BOX WITH 10 FUSES NEW!!! D215651J 25A 690V AC aM. FERRAZ SHAWMUT. Catalog No: A50QS80-4. Volts: 500. Catalog No: ATDR6. CLASS CC REJECTION. APPROVAL UL 198L, UL 248-4, CSA C22.2. Current Limiting Class RK5 fuse. Fuse Holders (23). Circuit Breakers (81). High Quality Electronic Parts. Physical Size: 0.83" x 5". Witonics® specializes in the sales of high-quality electronics components and repair kits. Model Number: A6T800. 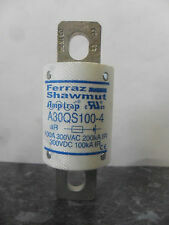 Ferraz Shawmut Fuse. Product Line: Class T. Volts AC: 600. 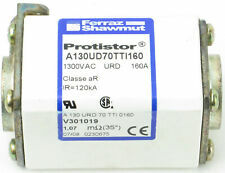 Ferraz Shawmut A480R6R-1 Fuse, 4800V R-Rated Fuse 6R. This is a "lot" sale. There are 10 fuses in each box. Catalog No: A6T110. Volts: 600. APPROVAL UL 198L, UL 248-15, CSA C22.2. New In Box. WE HAVE THE FUSES! THE OTHERS HAVE EXCUSES……. TR125R Smart Spot. TR125R is Equal to Buss FRN R 125. Ferraz Shawmut. Current Limiting. New In Box. WE HAVE THE FUSES! THE OTHERS HAVE EXCUSES……. FERRAZ SHAWMUT 22X58 50A 690V AC gG W200763J BOX WITH 10 FUSES NEW!!! W200763J gG 690V AC 50A. We manufacture large motor drives and power converters.